It’s not even Thanksgiving yet and I’ve made more Christmas cards than I care to count! I’m so ready to move onto something new. 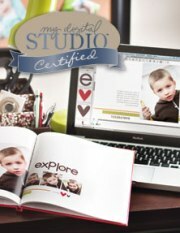 In about a week, I can preorder new stuff from the Occasions Mini Catalog and I’m excited! This card was made using Soft Suede as the base, layered with a soft suede striped DSP from Christmas Cocoa. I stamped the leaf from Berry Christmas in Old Olive ink, and added 3 Circle Rhinestone Brads for holly berries. The bird is also from Berry Christmas and I stamped it in Real Red ink, trimming it out with my scissors and adhering it to the base with a dimensional. Underneath the leaf, I used my Paper Piercer to make a row of dots. As for the sentiment, from Heard from the Heart, I colored in the words with Old Olive marker and “Christmas” with Real Red marker. The Whisper White layer was then attached to Real Red textured card stock with dimensionals. The shimmer paints have proven to be very versatile! You can use them as ink directly on the stamp, or mix them with reinker and sponge it onto the stamp, sponge the shimmer paint onto card stock, or even mix them with 70% alcohol and make shimmer mist. This card uses Champagne Shimmer Paint in two ways. First, I mixed Real Red reinker with the Champagne Shimmer Paint in an empty button container, then sponged it onto the poinsettia stamp from Berry Christmas with a Sponge Dauber. I did the same technique for the centers, with So Saffron reinker and the Shimmer Paint. As for the card base, it’s a 4″ x 8″ piece of Always Artichoke, folded in half to make a 4″x4″ square. Using the Champagne Shimmer Mist on a Sponge, I sponged the paint around the edges of the card. The stamped image layer is Whisper White, matted with Real Red Textured card stock. The greeting is from Heard from the Heart. I colored in the words with my Always Artichoke marker and sponged the Real Red/Champagne mixture on “christmas” with a Sponge Dauber. That Real Red/Champagne Shimmer Paint combo is gorgeous in real life. It’s like adding glitter to your ink! 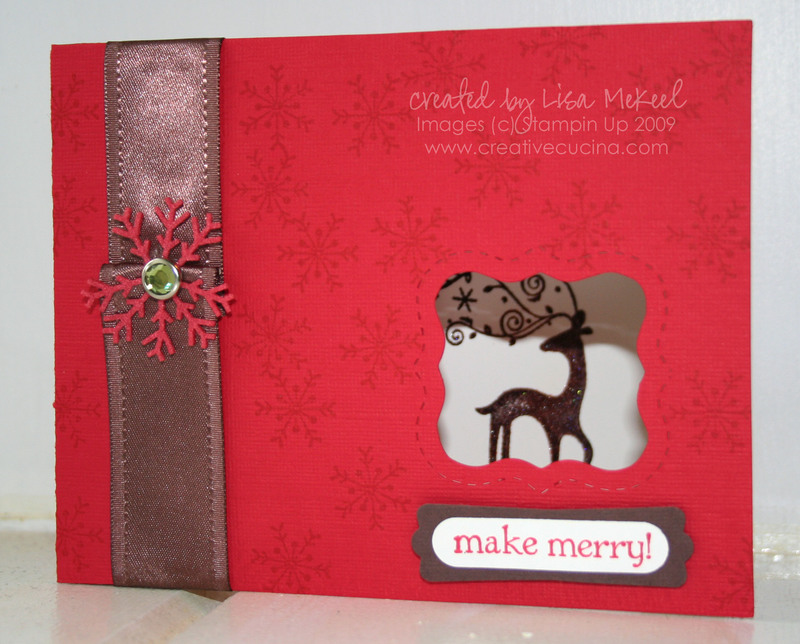 The idea for this card came about from trying to glitter up the Dasher Reindeer stamp. My brown glitter wasn’t sticking permanently and I almost gave up completely when I decided to try iridescent ice embossing powder. On whisper white card stock, I stamped the reindeer in chocolate chip craft ink, then heat embossed it with iridescent ice. Then, using the stampamajig, I stamped the image again in chocolate chip craft ink and heat embossed it with clear embossing powder, which gave it a little more shine. The whisper white card stock was then adhered to the inside of the card. Placement of the reindeer is important, so I made light pencil marks on my white card stock around the curly label window. The card base is real red textured card stock, cut with the Movers and Shapers die in the Big Shot. 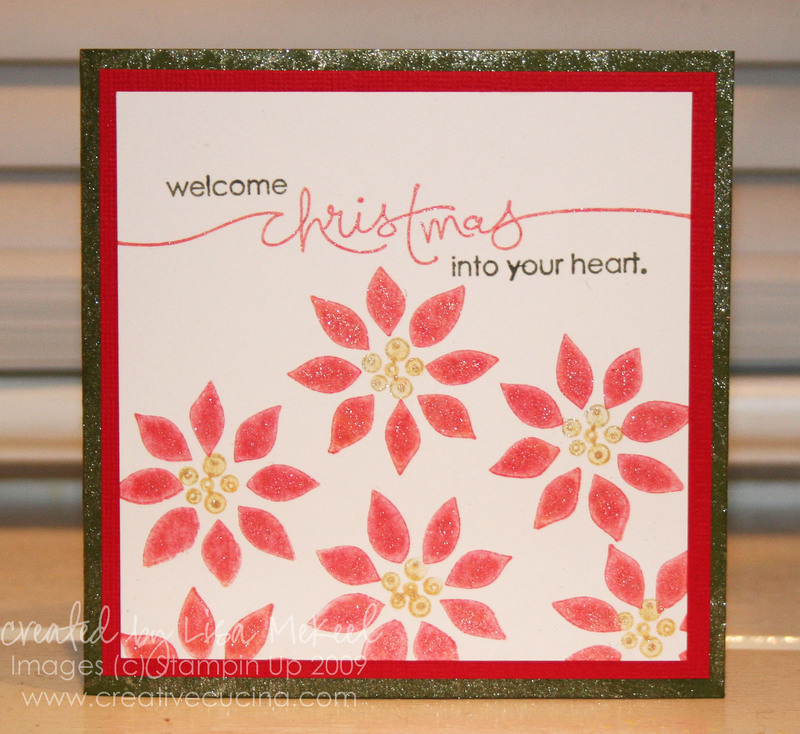 I stamped the front randomly with the snowflake from Season of Friendship in real red ink. Along the side, I took some Chocolate Chip Satin Ribbon and added a Felt Flurry and a Circle Rhinestone Brad, which I attached using the cropadile. 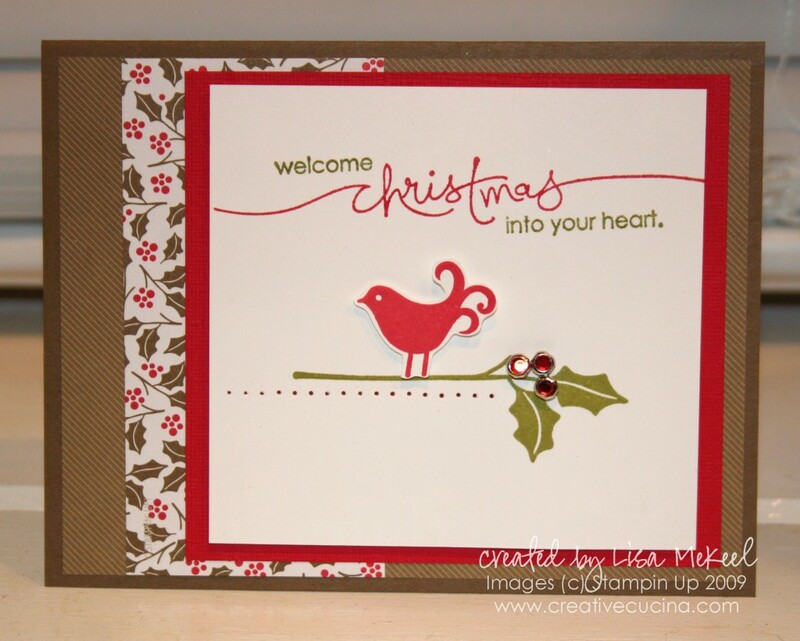 Below the curly label window, I stamped the greeting from Berry Christmas in real red ink on whisper white. I punched it out using the Word Window Punch and layered it on chocolate chip card stock I punched with the Modern Label Punch. That is attached to the card using dimensionals.